-What direction was the photographer facing? The photographer was shooting to the east. The cyclists were heading west. 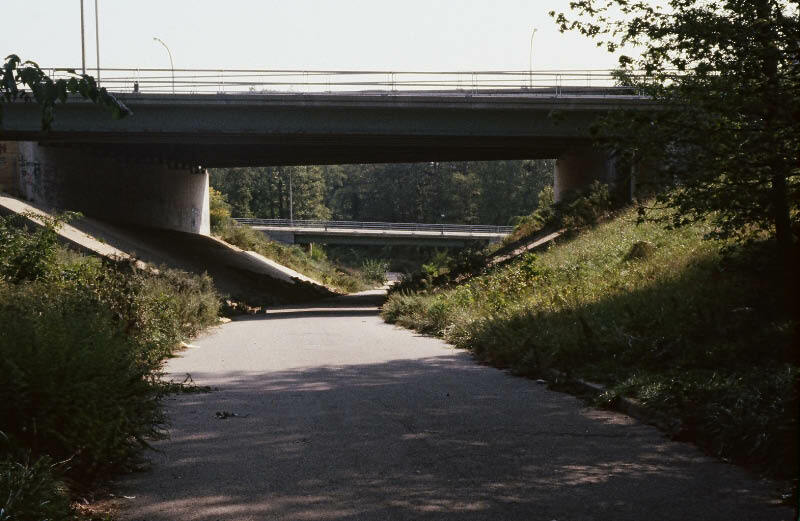 The bridge in the background carried the Grand Central Parkway over the Motor Parkway. It was built by Robert Moses in 1932-1933. The posts for a bridal path bridge also built by Robert Moses can also be seen in the foreground. -What is the earliest date that this photo could have been taken? Why? The photo date was September 15, 1940. Cyclists were not allowed on the Motor Parkway until it closed on April 17, 1938. A 2 1/2 mile bike path over this Queens section of the Motor Parkway was opened by the New York City Department of Parks on July 9, 1938. Congrats to Joe Oesterle, Tim Ivers, Brian McCarthy, Greg O., Steve Lucas, Art Kleiner and Frank Femenias for identifying both the location and the approximate year. Another view of the bridge with the same cyclists. They were riding over another bridge built by Robert Moses in the 1930s to connect a horse trail. The posts over the horse trail bridge. Another wonderful aerial showing the Motor Parkway around Alley Pond Park in Queens. A close-up showing the Grand Central Parkway Bridge and the horse trail bridge. The Grand Central Parkway Bridge looking east as it looked in 2010. The horse trail bridge as seen in 2010. In this 2009 video of the Brooklyn-Queens Greenway Bike Path, the Grand Central Parkway bridge can be seen at 4 minutes 26 seconds. LIMP crossing under the Grand Central Parkway. Looking to the south, as the parkway heads east. 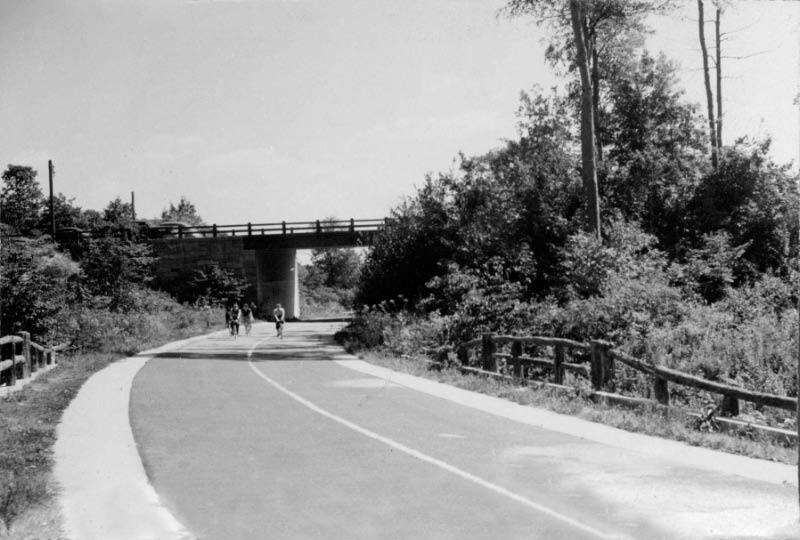 Bicycle path opened immediately after parkway closed, so 1938. 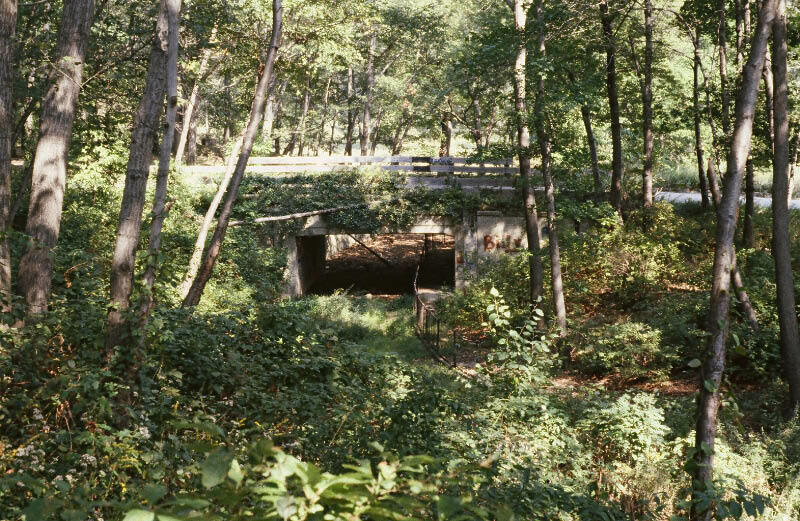 The Grand Central Parkway bridge over the LIMP in Alley Pond Park taken in 1940. The LIMP had been closed two years earlier and Queens was using it as a bikeway. The widened shoulders are visible. Nice photo, Frank. This has a “Queens” look to it. I believe this is Alley Pond Park. The photographer is looking east towards the bicyclists and the Grand Central Pkwy behind them. Has to be post 1938, or the bikes would’ntbe allowed on there. I like the side railings on both sides of the LIMP. Is it me, or is there possibly a path underneath the LIMP in the vicinity of the railings? This is a tricky one. First off riding bicycles on the parkway, since when? then the cars on the bridge, look to be like the late 30s early 40s, very questionable about that. The only question I can answer is about the date. 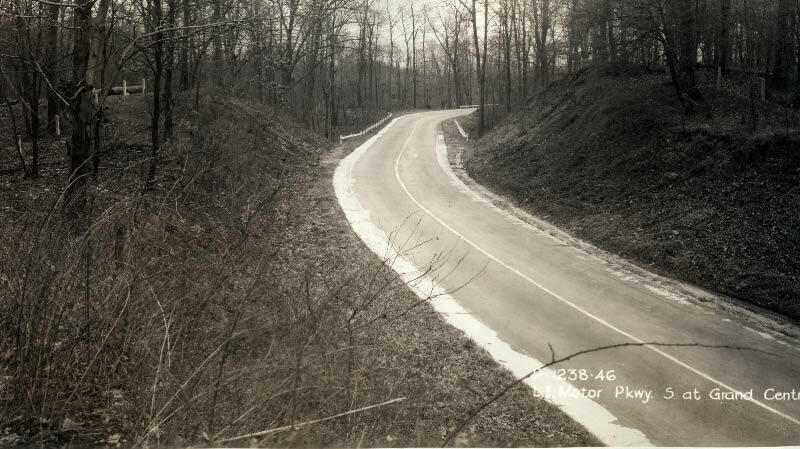 Since the parkway was closed in 1938, that would be the earliest date that would have bicyclists using it. Immediately West of the Grand Central Pkwy on the LIMP bike path in Queens. 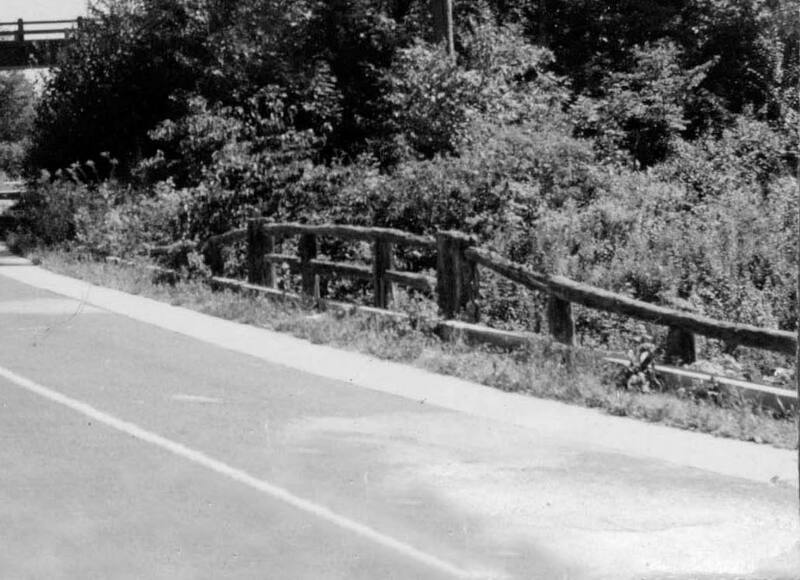 Due to the bicycles being on the LIMP in the photo, the earliest possible date would be July 9, 1938 when the LIMP section in Queens officially opened as a bike path. 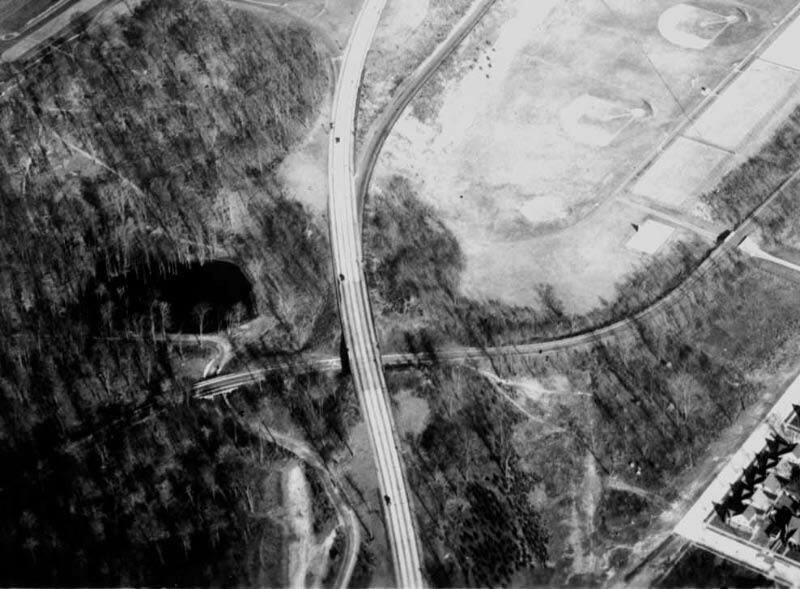 However, judging from the 2 cars on the GCP overpass, it appears the date for this photo is most likely in the early 1940’s. Howard, were you or Al able to uncover any more information on the mystery ‘bikeway bridge’ in the foreground? This looks like the bridge carrying Grand Central Parkway over the Motor Parkway in Queens. I believe the photo was taken in 1940 although it could have been taken shortly after the LIMP closed to vehicular traffic in April, 1938 and converted into a bicycle path. Technically, it could even have been taken as early as 1933 when that section of the G.C.P. was completed if some kids had dared to challenge the automobile traffic with their bikes. I think the photographer is facing east. Too many possibilities for me to sort out but here’s a very uneducated guess. I believe its the Queens bikeway which opened in 1938 but to me looks later based on the cars on the bridge and the bikes. Since the bridge is going over the Parkway could it be the Grand Central Parkway? I would say photographer is facing east. Howard - finding posts is easier than your photos sometimes. 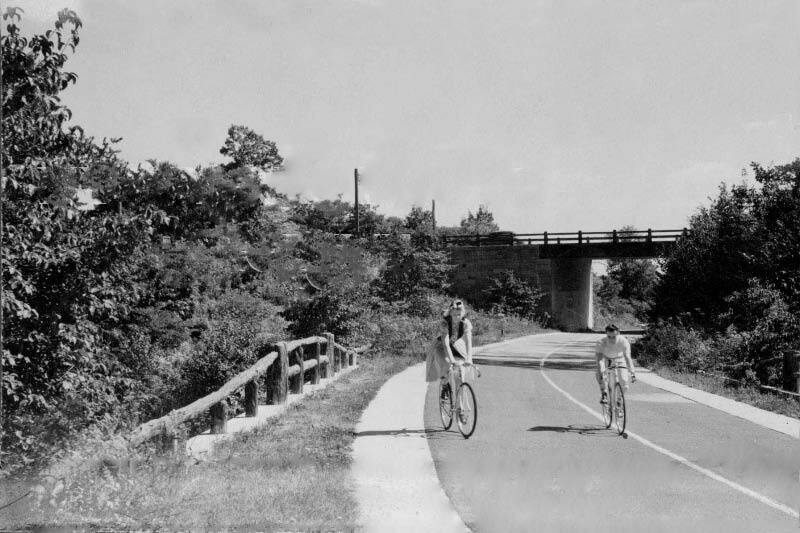 1940 Alley Pond Park heading eastbound under Robert Moses’ original GCP bridge, after the Motor Pkwy closed in 1938 for bicycle and pedestrian use. The bikes are heading west towards Rocky Hill Lodge (possibly still standing). 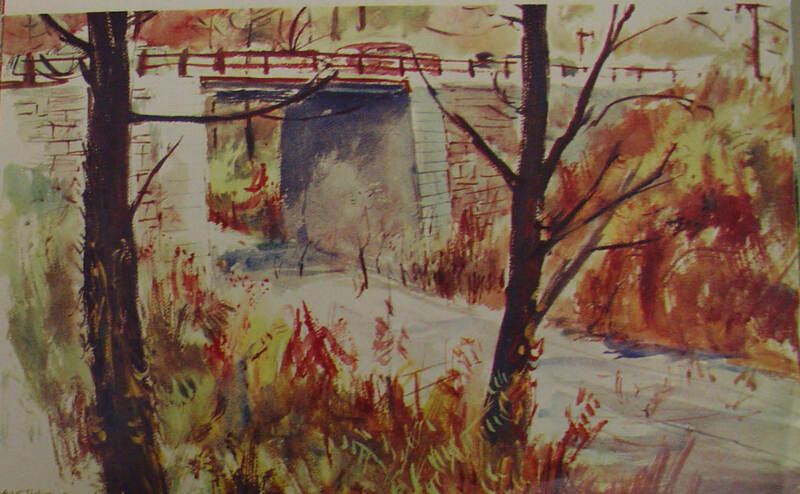 This may be the only image available of this early bridge besides a Harvey Kidder painting that was sketched on the opposite side at the bottom of the hill. …..And then there were many photos of the bridge. Never knew there was a pedestrian path under there. (the atlas doesn’t indicate a bridge, only monuments in this area) The path is still accessible where Kingsbury meets the GCP. I’ll be exploring there soon. Thank you Howard, Al, Greg, and all involved for displaying the wonderful photos and for the new discovery. That bridal path leads directly to the actually Alley Pond, now a badly drained swamp. My mom’s family would picnic there in the late 30s and early 40s. There is a small enclave of homeless people (a hobo camp of sorts) now camped out right to the side of that Grand Central overpass. 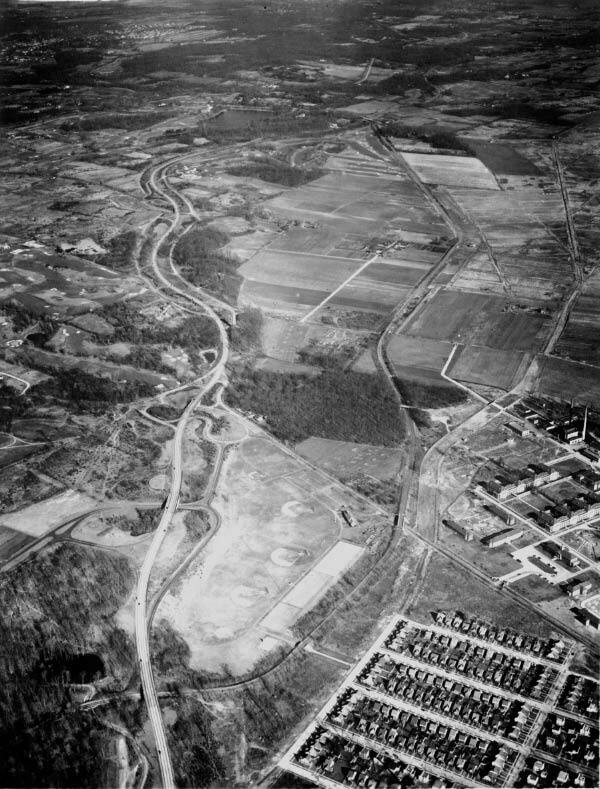 It the late 50s and very early 60s hobo camps dotted this area of the Vanderbilt, especially near what is now the area of the Clearview Expressway.